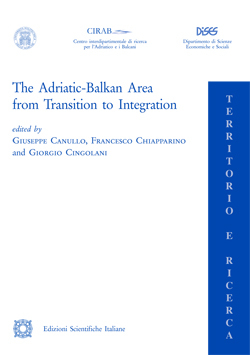 Collecting the contributions to the international conference held at Faculty of Economics «Giorgio Fuà», Ancona, in May 2010, this volume aims to provide a wide outlook of the structural transformations in the West Balkans and Adriatic area in the last decades. The social and economic problems of transition from the socialist regimes, the unsolved knots of nationalism, the chances for innovation and development, the role of human capital and the dynamics of incomes, the impact of the international crisis are some of the issues dealt by the set of case studies of the book. A special focus then is dedicated to the inter-Adriatic relations: migrations, remittances, foreign direct investments, trade flows and maritime traffic are analyzed prospecting the major role of the integration that this sea, after having been for decades a section of the Iron Curtain, can play for a future Adriatic macro-region. Hyrije Abazi, Lumir Abdixhiku, Marco Bellardi, Ivo Bicanic, Sarda Massimiliana Cammarota, Giuseppe Canullo, Eralba Cela, Francesco Chiapparino, Giorgio Cingolani, Giuliano Conti, Eleonora Cutrini, Andrea Feldman, Giorgio Galeazzi, Iraj Hashi, Saul D. Hoffman, Dušan Svetolik Janjic, Eros Moretti, Muhamet Mustafa, Nadan Petrovic, Paolo Pettenati, Artane Rizvanolli, Ida Simonella, Francesca Spigarelli, Nebojša Stojcic, Cristina Tiburzi, Milica Uvalic, Oriana Vukoja, Vladimir Vuletic, Alban Zogaj.